The Forge Blow off valve adapter for the MCS is a sandwich type adaptor that fits between the existing electrical solenoid and the turbo charger housing.On the Coopers S turbo, built into the turbocharger housing, is a bypass facility. This allows charge air to be recirculated around the turbo charger from the boost side back to the intake side. This recirculation path is opened and closed by means of an electrical connection from the engine management to a solenoid that is mounted on the turbocharger housing. As you accelerate , the turbo charger vanes are spinning and boost pressure is increased, literally blowing into the engine cylinders. Then when you change gear you take you foot of the accelerator momentarily, select the next gear, and accelerate again. As you take your foot off the accelerator the throttle valve to the engine closes. The problem here is that during this process the turbo is still spinning and the boost pressure that it is producing has no where to go. (This is a bit like putting you hand over a hair dryer so the air cannot get out) What happens at this point is the turbo starts to stall, the spinning vanes slow down (incurring alot of stress) and the boost pressure drops. When you open the throttle valve again by pushing down on the accelerator (demanding more power) the turbo has lost its momentum, boost pressure and there is a pause or a "Lag" before the engine is producing the required power once again. To combat this loss of power and stress on the turbo, a recirculation or diverter valve is used. On the Mini, when the throttle valve closes, the engine management opens the recirculation route around the turbo. This gives the charge air an alternative route and allows the turbocharger to keep spinning so that when you accelerate again there is no "lag" or waiting period. This system works well and is adopted by nearly all vehicle manufacturers on turbo charged petrol engine applications. The only downside to this system is that a turbo chargers produce heat. (The hot air that leaves a turbo is cooled by passing it through an intercooler before it enters the engine. The cooler the air the more power is produced. ) By recirculating the hot air back into the intake side of a turbo the temperatures increase. This is where the Blow Off or Dump valve plays its part. By expelling the charge air to atmosphere rather than recirculating it, you do not increase the intake air temperature but you do allow the turbo to keep spinning. The side effect which is unacceptable to most vehicle manufacturers is the noise of the valve expelling the air. By fitting the FMDVMCS between the existing solenoid and the turbo housing (this involves removing only 3 bolts) the air is re-directed to atmosphere rather than recirculated. Due to this part venting direct to the atmosphere you may get a check engine light since the ECU does not see the boost recirculate like it wants. Therefore this is no warranty, exchange or refund on this part for getting a check engine light. 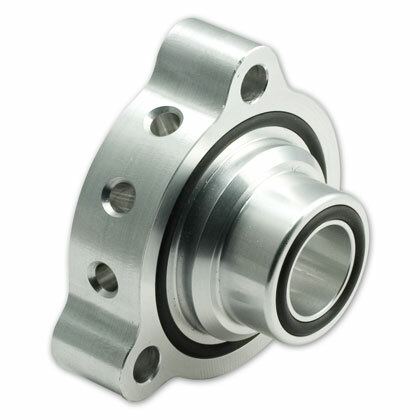 This product is available in machined alloy finish only.